Make your WordPress application sing with VERA VC Addons Bundle - Audio Players, Radio Players, Video Players, Logos Showcase, Multimedia Carousel, CountDown Timer Pro! Make your WordPress application sing with VERA VC Addons Bundle – Audio Players, Radio Players, Video Players, Logos Showcase, Multimedia Carousel, CountDown Timer Pro! 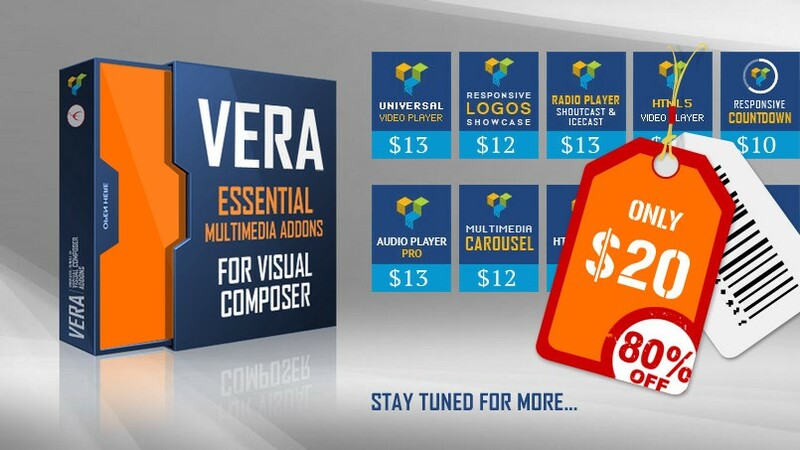 VC Addons Bundle – VERA brings together multiple responsive plugins including audio, radio and video players, logos showcase, multimedia carousel, that will make your WordPress application sing! Once you purchase this visual composer addons bundle, you regularly receive free updates. And more than this, you will not have to pay anything for the new products that we will add to the package. Also, on each plugin page you’ll find the associated video tutorial.